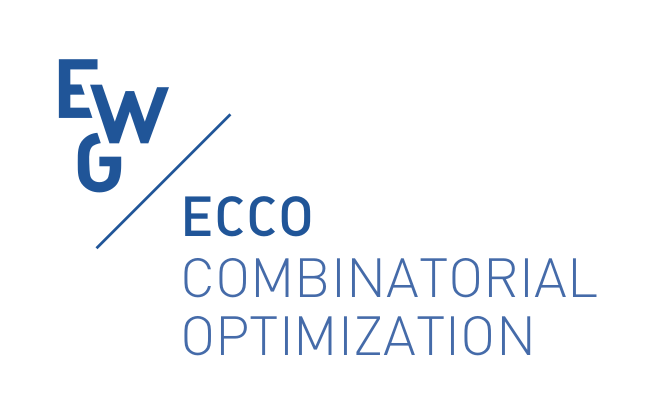 The EURO Working Group on Combinatorial Optimization, ECCO (European Chapter on Combinatorial Optimization) provides an excellent opportunity to discuss recent and important issues in Combinatorial Optimization and its applications with European combinatorialists; most European countries are represented. The group was created in 1987 by C. Roucairol, D. de Werra and A. Rinnooy Kan. C. Roucairol chaired for the first 10 years and now it's chaired by S. Martello. This group provides an excellent opportunity to discuss recent and important issues in Combinatorial Optimization and its applications with European combinatorialists; most European countries are represented. The groupe is suitable for people who are presently engaged in Combinatorial Optimization (CO), either in theoritical aspects or in business, industry or public administration applications ... All the fields are taken in consideration: operations management - logistics, production scheduling location and distribution problem, ressource allocation, flexible manufacturing ..., - engineering, VLSI design and computer design, network design, ... Recent sessions in last ECCOs have attached a particular emphasis to metaheuristics or new local search methods (tabu, genetic algorithm, ...), polyhedra approaches to difficult problems, recent developments in classical optimization problems (scheduling, assignmentn knapsack, partitioning, ...). The meetings are held on a regular basis (once a year during Spring) and nicely combine scientific work and the exchange of new ideas with an exciting atmosphere, as in Paris, May 1988; Venice, June 1989; Barcelona, May 1990; Dubrovnik, May 1991; (cancelled), Graz, April 1992; Brussels, April 1993; Milan, February 1994; Poznan, May 1995; Dublin, April 1996; Tenerife, May 1997; Copenhagen, May 1998; Bendor, May 1999; Capri, May 2000; Bonn, May 2001; Lugano, May-June 2002; Molde, June 2003; Beirut, June 2004; Minsk, May 2005; Porto (joinlty with CO), May 2006; Cyprus, May 2007; Dubrovnik, May 2008; Jerusalem, May 2009; Malaga (joinlty with CO), May 2010; Amsterdam, May-June 2011; Antalya, April 2012; Paris, May-June 2013; Munich (joinlty with CO), May 2014; Catania, May 2015; Budapest, May 2016; Koper, May 2017; Fribourg (joinlty with CO), June 2018. ECCO XXXII 2019 conference at St. Julian's in Malta is scheduled for May 30-June 01, 2019. An abstract booklet is distributed to the participants at each meeting. According to the new EURO Branding initiative, new logos were created for EURO and all EURO Working Groups as one may remark on the left of this page. For the memory, here are the old logos.